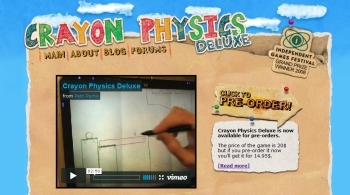 I’ve also setup the pre-orders for Crayon Physics Deluxe. You can pre-order the game from PayPal now. (You don’t have to have a PayPal account, just click the continue located on top of the credit card row). Save 5$. The prize of the finished game is going to be 20$, but if you pre-order during November you’ll get the game for 14.95$. The way this works is after your transaction has been processed by PayPal you’ll receive a confirmation email from Kloonigames with a super secret key. Once the game is ready to be beta tested, you’ll get another email with a download link to the game. (And I’ll also email you once the game is finished so you can download the full version as well). There won’t be any kind of DRM, because I’ve found that it only hurts the real customers (e.g. I’m an owner of Space Rangers 2, which I can’t play because the DRM is incompatible with my computer). And no DRM will stop people from pirating your game. If you have any questions you can email support@crayonphysics.com or write a comment. So I’ve been working on Crayon Physics Deluxe full time for about a year and a half now. It’s a small miracle that I’ve been able to pay my rent on time, without having a real income. The game itself has made some really good progress and it’s never been as close to being finished as it is now 😉 But there’s still stuff to be done and graphics to be tightened up. And in regards to that, here’s the official release date: When it’s done! Sorry about the big font. I’d love to see the game released during this year and I’ve been working hard to make that happen. Wish me best of luck and bug free code. The game will be released as a downloadable PC game and the full version of the game is going to cost the standard 20$. There’s going to be a free demo that you can try out. And the game is going to be released on this site. (There might be some other distribution channels as well, but I can’t talk about them now). I can’t promise Mac or Linux ports, but I’ll try to do my best to bring the game to those platforms as well. Also concerning all the other platforms: I can’t promise anything. We will see what the future brings. I’ll try to setup a FAQ so post your questions in the comments and I’ll try to answer them to the best of my abilities. You are currently browsing the Kloonigames weblog archives for November, 2008.